In a bowl mix curds, mayonnaise garlic, mustard, Worcestershire sauce and add salt to taste. Toss lettuce and croutons together. Add above dressing (as required) and toss the salad and some freshly grated pepper. Garnish with cheese and serve. For the Dressing: Heat olive oil and remove from flame. Add garlic, red chili flakes and mixed herbs. let it stand till cool. add the lime juice, vinegar, salt and sugar. Keep aside for 2 hours. 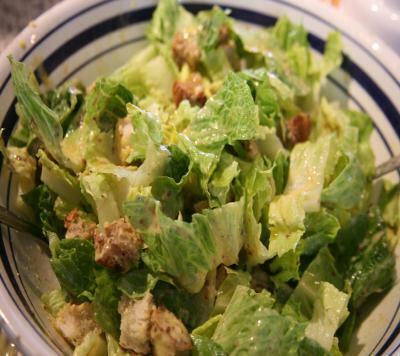 At the time of serving: Toss the salad ingredients together and add the salad dressing and toss and serve. For Salad:- carrots, cucumber, red bell pepper, lecctuce--- quarted. Mash the black olives to get a rough paste or then grind in a mixer. remove in a heat proof bowl and add rest of the ingredients except oil. Heat oil and add this hot oil to the olive mixture. let it stand for half hour. Dice cucumbers, carrots, radish, lettuce etc and toss in the above salad at time of serving. Heat oil in a pan add peanuts toss till they fry. Add potoes toss till browm specks appear on them. Whisk together curds, mustard paste, vinegar, olive oil, garlic, salt and oregano. Keep to chill. At the time of serving toss together corn, cucumber, onion and tomatoes. Mix in the dressing and serve chilled. Grate the carrot and radish. Squeeze out water from them and keep to chill. At the time of serving mix in rest of the ingredients. Toss and serve. Think different : to make it Italian add mixed herbs or any one of dips we make in class or then the chili oil. Corn can be substituted for sprouts too. This is how we make the recipes work for us one salad can be made different every time. it's imposible, so many recetas.